Koddiya have helmat ??? 57 motor cyclist arrested wait & see who will bail out them !!! Common DD . I hope M and R company will understand the language. Some thought he is a genuinely honest person when he came with his sad stories during the election campaign. Now it is obvious he is a slave of Ranil and Chandrika modi and has to toe their line of Tamil Diaspora as he took the blood money offered by India, USA and UK. 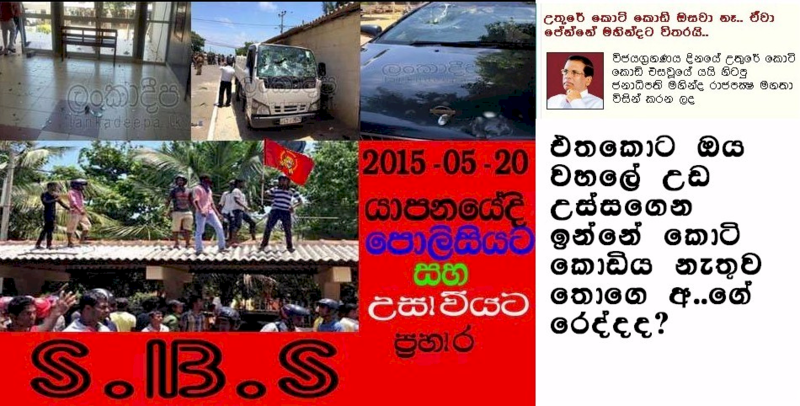 He is a gutless, shameless traitor and is an insult to all intelligent and patriotic Sri Lankans. What a pathetic lire. I am glad that the SL authorities have allowed the terrorist supporters to come out of the wood work display their flags, just as in UK.This is a sinister plan to locate them, good work I say. Now we know who they are and they must do the needful to protect the country..